3. Rachel Lockey Genung, daughter of Benjamin & Hannah (Beach) Genung, born Feb. 4, 1790 died Sept. 23, 1863. Born in Morris Co., NJ, Came to Tompkins Co., NY in the year of 1800 with her family. She lived at Pew Town now East Hill at Judd Falls and Pine Tree Road, Town of Ithaca, NY. She is buried in East Lawn Cemetery, Town of Ithaca. She was twice married - her first husband was William Pew Jr., after his death she married Dennis Turner and lived at Waterburg, NY. She had no children by Dennis Turner, all children were by William Pew Jr. Married Sept. 8, 1806 William Pew Jr., son of William & Hannah (Lacy) Pew, born Feb. 24, 1787 died June 1, 1832 - born at Bottle Hill, (now Madison) NJ. He was a farmer at Pew Town, NY. His parents were the first Pew settlers in Ithaca, NY., William served in the War of 1812 He was one of the jury that convicted Guy C. Clark, the murderer, who killed his wife with an axe in Ithaca, NY., 1832. He also is buried in East Lawn Cemetery Ithaca, NY. Their children were: Dan, Hannah, Elizabeth H., Sally, Mary Ann, William, Rachel Matilda, Margaret R., Nancy M., George Washington, Angeline. Hill, Town of Dryden, NY. Capt. of rifle Company, buried in Snyder Hill Cemetery, Town of Dryden, NY. born May 7, 1809 died March 10, 1906, born at South Hill, Ithaca, NY. After her husband death she lived with her daughter in Grotto, Town of Groton, NY where she died. Buried in Snyder Hill Cemetery, Town of Dryden, NY. Children; Ann, William Edward, Martha Ann. Buried East Lawn Cemetery, Ithaca, NY. daughter of Lewis English and Harriet Jane Overacker. buried in Snyder Hill Cemetery. born at Snyder Hill, NY., lived at Snyder Hill, NY until 1902, then she moved to Grotto, near Groton, NY., she is buried in Snyder Hill Cemetery. Married May 1, to Harry A. Snyder son of Joseph & Phebe (Cooper) Snyder, born Nov. 21, 1821 died May 5, 1898. He was a wagon maker, and farmer on Snyder Hill, NY. Buried in Snyder Hill Cemetery. He had first married to Adaliza Hemingway on Oct. 25, 1855, she is also buried in Snyder Hill Cemetery. They had a child Elwin J. Snyder who married Jennie M. Snyder, dau. of DeWitt & Helen (Searles) Snyder. Martha had no children but raised Elwin her step-son. Martha married 2nd Aug. 14, 1902 to Rev. Estus VanMarter who was born Feb. 17, 1837 died 1925, son of Mansfield & Polly (Saxter) VanMarter. He had been married before to Margaret Sovocool and had a child Elva VanMarter who married Cary M. English. Rev. E. VanMarter was a Methodist Minister and preached at Sandy Creek, NY., and Snyder Hill, NY. He was also a Farmer at Grotto, Groton, NY. b. Hannah Pew, daughter of Rachel Locey Genung and William Pew Jr. born March 29, 1811 died Oct. 15, 1881. Lived in Brookton, NY (Now Brooktondale, Town of Caroline, Tompkins Co., NY.) Buried at Roe Cemetery, Brooktondale, NY. (unmarked grave) Married Jan. 17, 1836 Robert V. Joiner, born May 28, 1805 died May 1888, Harness maker, buried in Roe Cemetery, Brooktondale, NY. born Nov. 29, 1836 died March 16, 1875 - born at Besemer, NY. Buried in Roe Cemetery, Brooktondale, NY. His headstone is in very poor condition and hard to read. William married Nov. 26, 1858 Mary Wyman born May 4, 1839 died ______. After William's death she married 2nd to Simon Sawyer and moved to Hornellsville,NY. 2. Amelia Joiner, daughter of William Joiner and Mary Wyman, born April 17, 1861 died June 27, 1900 - lived in Ithaca, NY., Married April 10, 1879 to Adelbert H. Mackey born May 31, 1853 - House painter in Ithaca, NY. 3. Louisa Joiner, daughter of William Joiner and Mary Wyman, born Sept. 5, 1868 - lived in Tompkins Co., NY - later she lived in Hornellsville, NY - then near Candor, Tioga Co., NY. c. Elizabeth H. Pew daughter of Rachel Lockey Genung and William Pew Jr., born June 12, 1813 died Oct. 8, 1855. Lived in Ithaca, NY., buried in East Lawn Cemetery, Ithaca, NY. Married Benjamin Morse born? died July 4, 1839 - Killed by explosion at a fourth of July celebration in Ithaca, NY. He is buried in East Lawn Cemetery, Ithaca, NY. 1. Mary Elizabeth Whitlock born Nov. 2, 1856 died______ Born at Ithaca, NY - lived in Lansing, NY.m later in Ithaca, NY. Married Edward S. Floulkes born Sept. 7, 1857 born in England, House painter in Ithaca, NY. Children; May L.; Abbie I.; Edward Whitlock; Jesse A. 3. Edward Whitlock Floulkes born Sept. 14, 1878 Enlisted Dec./. 29, 1899 in Co., K, 13th Infantry, served in Luzon, Philippine Islands, and at San Francisco, Ca. married July 3, 1903 Anna E. Talbot of Alburn, NY. with 14th Infantry, In Palawan, Philippine Islands with 10th Infantry, honorably discharged Aug. 1, 1902. Employed at rolling mill, Auburn, NY. Married Jan. 1, 1905 to Bertha Barr. 2. Sarah J. Whitlock daughter of Harriet Newell Morse and George M. Whitlock, born Feb. 15, 1859 died ________ Born at Ithaca, NY., lived at Owego, NY., later Ithaca, NY. Married Sept. 10, 1876 Almeron Maricle born March 10, 1853 died ______. House painter and Paper hanger. Children; Lena A., and William C.
1. Carl Almeron Linderberry, born May 7, 1901 lived in Detroit, Mich, at the time of his mother's death. 3. Louesa Addie Whitlock, "Addie", daughter of Harriet Newell Morse and George M. Whitlock born July 31, 1862 died April 1, 1944, born and lived in Ithaca, NY. Twin with Louisa Alice Whitlock. Buried at East Lawn Cemetery, Ithaca, NY. Married Sept. 23, 1885 Edgar J. Shergur born abt. 1860 died March 15, 1926 - son of Benjamin Shergur & Ann Celesta ? Edgar J. Shergur was born in Richford, Tioga Co., NY. House painter and Paper hanger. Children: Roy C., and Lois A. 1. Roy C. Shergur, born Aug. 10, 1890 died Oct. 8, 1874 Manager of Swift and Co., in Ithaca, NY., Captain of the S.S. Horton on Cayuga Lake, running a passenger and freigh service 1914-1919. Moved to New Smyina Beach, Fla. Married 3 times. Married 1st; Viola Fuller; married 2nd, Sarah J. _________, born abt. 1890 died Sept. 12, 1946 buried in Lake View Cemetery. Married 3rd married, Delena __________, still living in 1974. 4. Louisa Alice Whitlock, daughter of Harreit Newell Morse & George M. Whitlock Born July 31, 1862 died Sept. 1899, born and lived in Ithaca, NY., Twin with Louesa Addie Whitlock, married _______________child George Whitlock born Nov. 25, 1879, has mother's family name. Was soldier in Philippine Islands. Born Sept. 2, 1868 died Oct. 20, 1868, buried in East Lawn Cemetery, Ithaca, NY. 2. May Bell Morse, daughter of James H. Morse & Mina Fogle, born Nov. 19, 1872 Lived in Kansas City, MO. James H. Morse married 2nd July 14, 1885 to Mary M. Minima born Oct. 20, 1850. Elizabeth Pew Morse married 2nd William Granger Snow, he enlisted at Ithaca, NY - Aug. 18, 1862 as private, Co. D, 143 d, NY Vols. Honorably discharged for disability Feb. 18, 1863. Re-enlisted June 27, 1863 as private Co. B , NY Calvary. Transferred to Invalid Corps. Honorably discharged for disability, June 15, 1865. Cabinet maker in Ithaca, NY. Buried in East Lawn Cemetery., Ithaca, NY. 3. William Gilbert Snow, son of Elizabeth Pew & William Granger Snow, born abt. 1841. In 1860 he was living with Jacob Peter Genung, in the Town of Dryden, Tompkins Co., NY. He is listed in that census as Gilbert Snow, age 18, farm laborer. Lived in Kansas City, MO., married to _______Weeks, children; James Frances, Addie. William Snow married 2nd _______________. Served in Civil War, Police Sergeant in Kansas City, MO. Married _________Landon, child Leon Snow. 2. Urena Jane Sloughter, daughter of Sally Pew & Benjamin V. Sloughter, born July 23, 1838 died Jan. 2, 1881 Married Feb. 12, 1859 Barnabas Genung, son of Barnabas & Susannah (Johnson) Genung, born April 4, 1833 died June 25, 1904 See Barnabas Genung and Urena Jane Sloughter for more family history. 3. Philo Chester Sloughter, son of Sally Pew & Benjamin V. Sloughter, born Aug. 4, 1840 Undertaker, Milford, Mich. married Eliza Smith - they had at least two daughters. 4. Blondina Vandermark Sloughter, daughter of Sally Pew & Benjamin V. Sloughter born Oct. 9, 1842 died Jan.. 7, 1922, lived in Brooktondale, NY., married Jan. 12, 1888 Franklin P. Wall, born March 15, 1852 died Sept. 2, 1894, killed in a railroad accident, no children. Frances Jewell, dau. of Matthew Jewell& Lovina Hearty, born Oct. 17, 1841 died 1914, also buried in South Hill Cem. born April 26, 1868 died Jan. 30, 1952, daughter of William Stevens and Nancy Boice. 6. Richard Middaugh Sloughter, son of Sally Pew & Benjamin V. Sloughter, born April 7, 1847 died Jan. 4, 1916 Married Martha Olney, children: Minnie A., George; Robert S., Harriet H.
2. 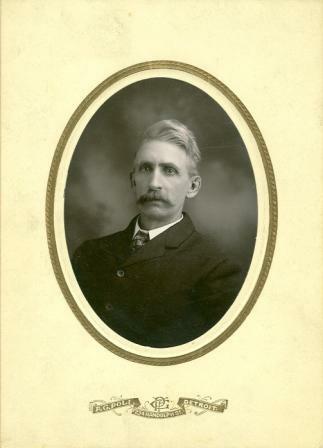 Chester S. Bell, son of Rachel Elizabeth Sloughter and George H. Bell, born abt. 1880 died Aug. 3, 1955, buried in Quick Cemetery, Brooktondale, NY. Married Sarah J. Buckley born 1886 died 1976. 3. Cora Bell, daughter of Rachel Elizabeth Sloughter and George H. Bell, born 1884 died 1970 Married Harry M. Straight born 1879 died July 1,1932, son of Hiram Straight & Parmelia C. Payne. Both are buried in Caroline Grove Cemetery, Town of Caroline, Tompkins Co., NY. Children; Nellie; Kenneth; Edward; Howard; Harry. 10. Iras Holmes Sloughter, son of Sally Pew & Benjamin V. Sloughter, born Aug. 3, 1856 died March 2, 1939 married Oct. 23, 1887 in Richford, NY. Alice Eunice Armstrong, born April 7, 1871 died July 22, 1954 daughter of George Armstrong & Nancy Henrietta Sawyer. Both are buried in Quick Cemetery, Town of Caroline, NY. Children; Corilla; Mamie; Esther; Paul; Ethel. Born in the Town of Dryden, lived at Snyder Hill, NY., Buried in Snyder Hill Cemetery. Married James Washington Banfield, son of Edward Banfield and Martha "Patty" Cooper, born March 14, 1814 died July 11, 1903 - born in the Town of Dryden, NY., Buried in Snyder Hill Cemetery. 2. Mary Ann Banfield, daughter of Mary Ann Pew and James W. Banfield, born Oct. 20, 1838 died Jan. 23, 1919.- married May 30, 1866 to George N. Pew, born April 17, 1840 died Jan. 9, 1901, son of Benjamin Pew & Nancy Mitchell. Their children were; Benjamin W., Nancy May; Fred G.
Children; Carrie D.; Ada Eliza; Edward A.; Mary Emerett; Clayton J.; Corry Judson; Charles Raymond; Verne; Lynn S.
1. Carrie D. Willsey, daughter of Martha J. Banfield and Simon Peter Willsey Jr born April 30, 1861 died June 13, 1892, born at Richford, NY, buried in East Lawn Cemetery, Ithaca, NY Married Nolan M. Smith. 4. Clayton J. Willsey, son of Martha J. Banfield and Simon Peter Willsey Jr. born Sept. 22, 1874 died Feb. 23, 1909 Headstone in Snyder Hill Cemetery, Ithaca reads, J. Clayton Willsey. Born at Richford, NY., Farmer in South Danby, NY., Was in a wheel chair, could not walk, reason unknown. Married Jan. 30, 1895 Carrie Walker born_______died April 20, 1927 age 56 yrs. Children of Arthur C. Willsey & Eva Deckman - (From an obit.) Edmund of Kansas City; Kenneth of Allegany Co.; Robert of Buffalo, NY; Clayton of Arizona; Richard of Whittier, Calif.; Mrs Kenneth Wise of Canandaiqua; Mrs Carl Durrant. Step children; Mrs. Donald Osborne of Olean, NY;Mrs. Milton Bailey of Livermore, Calif. Andrew Hamm. 2. Bertram I. Willsey born August 22, 1907 died Jan. 11, 1974 Worked for the Ithaca School District, member of the Slaterville Fire Dept. Buried at East Lawn Cemetery, Ithaca, NY. 5. Corry Judson Willsey, son of Martha J. Banfield and Simon Peter Willsey Jr.
1. Mary Elizabeth Willsey born Dec. 8, 1905 - married Dec. 12, 1924 to Samuel VanKirk, children; Geraldine; Richard; Constance. Children; Joseph R., Kay Ann. she died of a heart attack, she was living at 109 W. Clinton St. at the time of her death. Buried at Calvary Cemetery, Ithaca, NY. They had two daughters. 7. Verne Warren Willsey, son of Martha J. Banfield and Simon Peter Willsey Jr. Born at Caroline, NY., farmer at Ithaca, NY., he worked at Ithaca Gun Company. Buried in East Lawn Cemetery Married April 2, 1901 Veda Blanche Perkins born Sept. 26, 1883 died March 20, 1947, born at Slaterville, NY. daughter of Edward Perkins and Ella Oliver. Children; Alfred, Ella, Alice, Ralph, Carl, Edna, Ruth, Paul, Robert, Barbara, Norma. 8. Lynn S. Willsey, son of Martha J. Banfield and Simon Peter Willsey Jr. born April 26, 1883 died March 12, 1972 Born on Snyder Hill, NY., farmer at Snyder Hill, had been a blacksmith in the Ithaca area for years. Buried in East Lawn Cemetery, Ithaca, NY. Married April 19, 1905 Harriet L. Pease "Hattie" born 1873 died July 28, 1956, she was the daughter of L. F. Pease, she too is buried in East Lawn Cemetery, Ithaca, NY. born Aug. 24, 1870 died 1944 son of D. Uri Banfield and May Hemingway. 6. Jacob Eugene Banfield, son of Mary Ann Pew and James W. Banfield, born April 10, 1848 died May 9, 1916, married July 17, 1873 to Edna Loomis, born Jan. 17, 1856 died 1901. Children; Hettie; Arthur; Alice; Leslie; Cora. 7. Levi "Harvey" Banfield, son of Mary Ann Pew and James W. Banfield, born June 29, 1850 died Aug. 20, 1909, married Oct. 30, 1870 to Lottie Millage born March 28, 1852 died Jan. 21, 1901, daughter of George Millage & Maria Cornelius. Children; Frank; William; Millie; Lona; Lena; Clarence; Edna; Gertrude; Rodney; Harold. Farmer and Teamster, buried at East Lawn Cemetery, Ithaca, NY. Married Feb. 17, 1840 Hannah Deuel born Jan. 30, 1823 died Nov. 27, 1892, buried in Inlet Valley Cemetery, Ithaca, NY. Children; Elmer Elsworth, Melvin; John, William Adelbert. Harriet Pew married 2nd to Howard Barrett, child Lydia May died Dec. 30, 1888, buried in Inlet Valley Cemetery, Ithaca. 1. George Uchlet Benham, son of Rachel Matilda Pew & Warren Uchlet Benham, born Sept. 13, 1842 died Sept. 18, 1842, buried in Ithaca City Cemetery, Ithaca, Tompkins Co., NY. 2. John Hull Benham, son of Rachel Matilda Pew & Warren Uchlet Benham born May 26, 1844 died March 14, 1845, buried in the Western part lot 81 of Ithaca City Cemetery, Ithaca, Tompkins Co., NY. a. John Francis Benham, son of George Warren & Margret (McKeon) Benham, born Nov. 22, 1874. (Note: his draft registration card states his year of birth was 1875, the 1874 date is from the Genung Genealogy, 1906) He may be the John Benham, buried in St. Paul Cemetery, Owosso, Michigan Sect. G., 1875-1938. Also buried in the Oak Hill Cemetery is Fannie Benham 1892-1944 Section N-11. 1910 census, Shiawassee Co., Mich, is John Benham, age 30; wife Alice L., age 20, Mrrtle H., age 5, George W., age 4, Ethel F., age 2, William H., age 1 month. In 1920 same place; John Benham, age 42, wife Alice age 31, Mrytle age 15, George age 14, Frances age 12, Joseph age 9. In 1930 same place, found is John Benham, age 52, b. Mich, father born NY, mother born Mich., married at the age of 29, wife Fannie Benham, married at the age of 18, step-son, William H. Sawer age 16, Philipena Hubert, step-mother, age 61 a widow. 4. 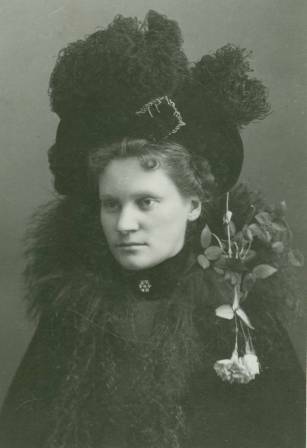 Medora Latilda Benham, daughter of Rachel Matilda Pew & Warren Uchlet Benham, born Oct. 3, 1848, lived in Corunna, Mich. Married Dennison Thompson, born abt. June 1836, in NY. They lived in Corunna, Shiawassee Co., Michigan. When Clarabell was a year old they were living in Caledonia, Shiawassee, Michigan. Medora was listed as Dora on that census. 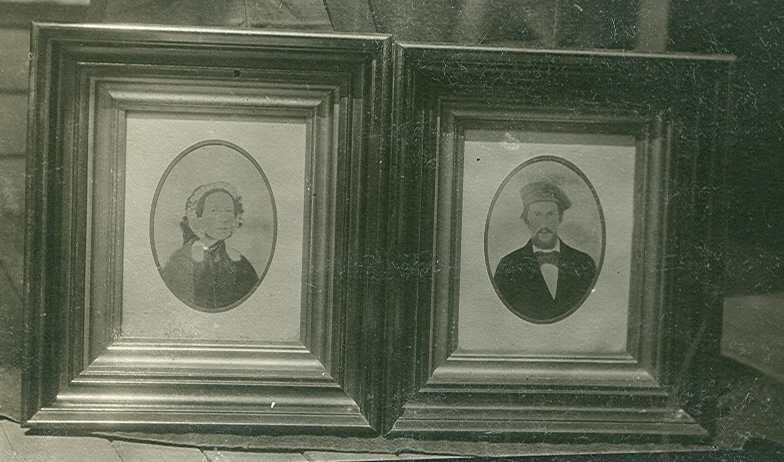 Living next door was most likely Dennison's parents, James & Madaline Thompson born in NY. Dennison died 1908, and Medora died Dec. 26, 1941 at Wayne, Dearborn, buried in Pine Hill Cemetery, Caledonia Township, Shiawassee, Michigan in Stowell's East, lot 7 - 21 - 1 & 2, they both have a single footstone to mark their grave. 5. Rachel Maria Benham, daughter of Rachel Matilda Pew & Warren Uchlet Benham, born Aug. 24, 1850 died May 17, 1866 (burned to death) There is a record of a Rachel M. Benham, dau. of Warren Benham being buried in Ithaca City Cemetery, Tompkins Co., NY. a. Maude May Watson, daughter of Simon Zelotus & Alice Esmarilda Benhan Watson, born April 27, 1875 at Corunna, Michigan. Lived in Owoso, Michigan, married May 21, 1894 to Ethan Herbert Graham, born May 5, 1872, born at Bath, Michigan. Casket trimmer. Musician in Owosso Light Infanry and Owosso Orchestra. Ethan Graham died 1940, buried in Oak Hill Cemetery, Section A-2. ii. Olive May Graham, born May 27, 1899 in Owosso, Michigan, she married Roscoe Augsbury, born 1900 died Jan. 3, 1962. They had a son Luther Augsbury. They had a farm outside Corunna. Some time in the 1950's they sold the farm and moved to Gen Burnie, MD. They operated a motel. Roscoe died late in the late 50's or 60's. Olive remained in Glen Burnie. She married 2nd Edward Metcalfe, a writer for the local newspaper. He wrote a booklet of poetry and dedicated it to her. They moved back to Michigan and he died there. Olive move into the Masonic Home in Alma, Michigan, (she and Roscoe had been very active in the Masconic), she died there Nov. 24, 1982, both Roscoe and Olive are buried in Hillcrest Cemetery, Owosso, Michigan in Sec. 2.
iii. Herbert Ethan Graham, born Sept. 22, 1902 in Owosso, Michigan, married Ruth (____), and had at least two children; Harold and Lois. Herbert was married again, her name is unknown. Herbert W. Graham died in 1980, buried in Oak Hill Cemetery, in Section N-9. Maude May Watson, daughter of Simon Zelotus & Alice Esmarilda Benhan Watson, married 2nd to Ross Allen McEachern, (pronounced Mc Akron-like Akron, Ohio). Ross sailed the Great Lakes Freighters. He left when Ray was about 2 years old (about 1915). Maude and her two sons lived in a duplex with Simon and Alice after that time. Maude is buried in Oak Hill Cemetery, Owosso, MI. children Ross Allen McEachern, lives in Flint, MI., two more sons, by his 2nd marriage, names unknown. children: Irene, Kathryn, Ray Douglas. 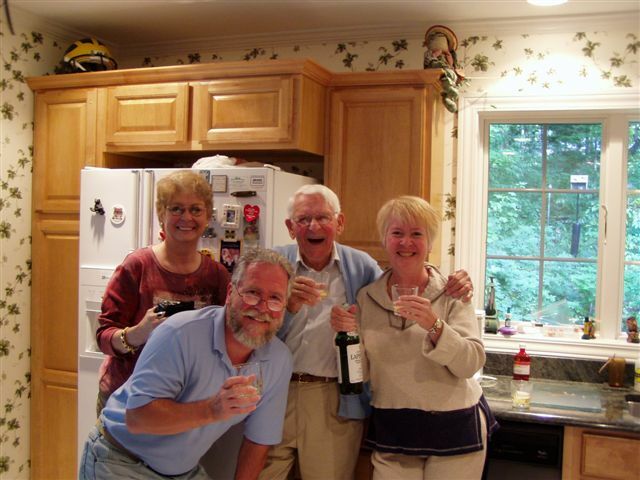 Ray & family on his 90th birthday. b. Winnifred Grace Watson, daughter of Simon Zelotus & Alice Esmarilda Benhan Watson, born Dec. 1, 1877 died Feb. 28, 1893. She was born in Corunna, Michigan and died in Owosso, Michigan. Buried in Oak Hill Cemetery, Owosso, MI. She is buried in Lot N-6 in Oak Hill Cemetery. c. Warren B. Watson, son of Simon Zelotus & Alice Esmarilda Benhan Watson, born May 31, 1880 at Corunna, Michigan. Casket trimmer. Member of Michigan National Guards. Lived at Owosso, Michigan. Married Oct. 4, 1899 to Mary Olive Love, born April 7, 1882. 1910 census Mary states she was the mother of 5 children 4 living. Warren B. Watson died 1916, buried Oak Hill Cemetery, Owosso, Michigan, Lot N-7. By 1920 Mary is remarried to Arthur E. Fox, living in Owosso Ward 5, Shiawassee, Michigan, he is 39 years old and is listed as the step father to all of the children below. Warren B. Watson died 1916, buried in Oak Hill Cemetery, Section N-7. h. Margaret R. Pew, daughter of Rachel Lockey Genung and William Pew Jr. born March 25, 1823 died Feb. 1, 1833, born at Pewtown, (now East Lawn - Judd Falls area, Town of Ithaca, NY. Buried at East Lawn Cemetery, Her headstone reads, Margaret R. daughter of William and Rachel Pew, died Feb. 1, 1833 in the 9th year of her age. 2. George J. Perry, son of Nancy M. Pew & James Perry born Aug. 6, 1865 died 1919, buried in Snyder Hill Cemetery, Town of Dryden, NY. Married March 9, 1887 Della Waldron born 1871 died?, a headstone at Snyder Hill Cemetery has her name and birth year with no death year. She was the daughter of George Waldron and Lydia Jeffery, she was born in Reynoldsville. George and Della are living with James and Nancy Perry in 1900, town of Caroline, no children listed. j. George Washington Pew, son of Rachel Lockey Genung and William Pew Jr. born Oct. 24, 1827 died ? Boatman and Cabinet maker in Ithaca, NY. Married Grace Ann Linderberry, born abt 1830 died ? No children; Married 2nd, after 1870 and before 1880 to Harriet S. Lee, born 1836 died Jan. 23, 1904, she was born in Wayne Co., NY., died in Ithaca, NY. Buried in Ithaca Cemetery. The Genung genealogy states he had no children. No children listed in the 1860 census, but in 1870 there is listed Alice Pew age 9 yrs. living with George and Grace Pew. Harriet Lee, his 2nd wife, must have been married 1st to a Mr. Bennett. In 1880 George and Harriet are living in Ithaca, Tompkins Co., with Eugene Bennett age 18, living in his household, listed as a step son to George W. Pew. 4. Philo Genung, son of Benjamin Genung and Hannah Beach born Jan. 17, 1793 died Feb. 10, 1881, Born at Morris Co., NJ., Farmer at his father's homsestead in the Town of Dryden, near Besemer, NY. Buried in Snyder Hill Cemetery, Town of Dryden, NY. Married 1814 Charity Cooper, daugher of Joseph Cooper and Phebe King, born Jan. 27, 1794 died Feb. 17, 1877, she is buried in Snyder Hill Cemetery, NY. Children; Louisa; Hannah; Phebe; Benjamin; John; Charlotte; Marthann; Harriet Lovina. 1. Louisa Genung ( "Eliza" in family bible), daughter of Philo Genung & Charity Cooper born March 8, 1815 died Sept. 23, 1842 - born at the Genung homestead on Slaterville Road, near Besemer, Town of Dryden, NY. Buried at Snyder Hill Cemetery. Married Jan. 26, 1834 Chester S. German born Jan. 31, 1812 died Sept. 4, 1848, buried in Snyder Hill Cemetery, Town of Dryden, NY He married 2nd to Louisa's sister Charlotte Genung. 2. Hannah Genung, daughter of Philo Genung & Charity Cooper born July 22, 1818 died Nov. 25, 1902, born at the old Genung Homestead, lived in Ithaca, NY. Buried in the Ithaca Cemetery. Married Feb. 14, 1838 William S. Minton, born March 30, 1816 died March 29, 1893, Stone mason, buried in Ithaca Cemetery (View his will) Children; John Wilbur; Laura Ella; Harriet Lena; Lula Louise; Henry M.
1. John Wilbur Minton, son of Hannah Genung & William S. Minton born March 18, 1839 died Sept. 23, 1863, Stone mason, married July 30, 1859 to Elizabeth A. Williams born 1843 died April 6, 1896, Elizabeth married 2nd after the death of John Minton, She married Warren Daniel Banfield, born Dec. 17, 1838 died March 15, 1915, son of David Banfield & Morjorie Cooper. John and Elizabeth had a daughter, Ida I. Minton, born Nov. 24, 1860 died Nov. 15, 1944, she married Feb. 25, 1880 to Byron Levi Ostrander born July 8, 1856 died Oct.13, 1919, son of Levi Ostrander & Tabitha Ann Banfield. Daniel and Elizabeth had a daughter, Lillie Althada Banfield born Dec. 23, 1868 died 1899, Lille married 1890 Charlie Mitchell, son of Jeremiah Mitchell & Pheobe Ostrander. 2. Laura "Ella" Minton, daughter of Hannah Genung & William S. Minton born April 20, 1847 died? (still living when her father died) Married Nov. 21, 1865 Charles W. Earle, born April 14, 1845, he was a carpenter. 1. Harriet Lena Earle, daughter of Laura Ella Minton & Charles W. Earle born Aug. 14, 1866 died Oct. 24, 1947, buried in Ithaca City Cemetery. She was born at Ithaca, NY., lived in Danby, NY. Married Aug. 27, 1887 William H. Baker, born July 31, 1848 died May 4, 1942 at the age of 73 yrs., 6mo., 9 dys, buried in the family plot in Ithaca City Cemetery. 2. Lula Louise Earle, daughter of Laura Ella Minton & Charles W. Earle born April 19, 1878, born and lived in Ithaca, NY. Attended Ithaca, High School. Was not married in 1947. 3. Norma Minton, daughter of Henry M. Minton & Franc Taber Ithaca Conservatory of Music. Still unmarried at the time of her cousins death (Harriet Lena Minton Baker) that took place Oct. 24, 1817. 3. Phebe Genung, daughter of Philo Genung & Charity Cooper born July 16, 1820 died June 10, 1890, born at the Old Genung Homstead on Slaterville Road, Town of Dryden, NY. Lived at South Danby, died at South Danby, NY. She is buried in the Town of Caroline, NY. Married Lyman S. Daniels born 1817 died 1901, on of Amos Daniels & Elvina/Alvana Fox. - buried in Green, Broome Co., NY. Children; Elmer, Charity A. 1. Clare Genung, son of Benjamin Genung & Nancy Fidelila Krum born May 5, 1855 died Feb. 1939, He was a farmer at White Church, Town of Caroline, NY. Married 1883 Allie Krum born abt. 1865 died March 14, 1946, she was the adopted daughter of Henry Krum of Caroline Depot, NY. 1. Robert Henry Genung born July 14, 1902, born in Freeville, Town of Dryden, NY. married 2 times, unknown who they were; disapeared in 1960 going to Florida, Family never knew what happened to him. Homer Genung, son of Benjamin Genung & Nancy Fidelila Krum married 2nd abt. 1909 Helena Morrison born May 1, 1875 died Jan. 24, 1927, a native of Brantford, Canada, she was assistant superintendent of the Ithaca Hospital at the time they married. Homer Genung, son of Benjamin Genung & Nancy Fidelila Krum married 3rd March 24, 1929 Cora S. Breese born abt. 1867 - she was born in Candor the daughter of Herman Strong & Cordelia Allen, she had been widowed. Adelaide "Addie" VanOstrand born 1848 died 1915, daughter of Peter VanOstrand & Katherine Nowlan. Children; Benjamin W., Cora Ellen. 3. Benjamin W. Genung, son of Benjamin Genung & Adelaide "Addie" VanOstrand born May 2, 1868 died ? Married Harriet Kintner born Aug. 20, 1895, she was from Bradford Co., Pa. Children; Edward, Catherine, Cora, Benjamin W. Jr.
3. Cora Ellen Genung, daughter of Benjamin W. Genung & Harriet Kintner born March 14, 1900. 4. Cora Ellen Genung, daughter of Benjamin Genung & Adelaide "Addie" VanOstrand born Oct. 11, 1874 died after 1950, Born at Besemer, NY. Studied Music in Paris, returned to Ithaca, gave singing lessons, was well know for her singing voice. Married June 23, 1897 Emile Monin Chamot born 1868 died 1950, he was born in Buffalo, NY. He was well known for work he did on the water supply treatment for Ithaca. No Children, both are buried in Snyder Hill Cemetery, Town of Dryden, NY. 5. John Genung, son of Philo Genung & Charity Cooper born Sept. 24, 1824 died June 22, 1908 - born and lived at Besemer, NY., Farmer, buried at Dutch Reform Cemetery, West Slaterville, NY. Married April 22, 1849 Maria Sarah Miller born July 9, 1826 died May 6, 1903 - also buried Dutch Reformed Cemetery, West Slaterville, Town of Caroline, Tompkins Co., NY Children; Morgan, Morton, John A. 1. Harold Bowman Genung, son of John A. Genung & Isabelle Bowman born ? - lived in the Town of Dryden, NY., married & divorced Jesse Bossard born? died 1985, daughter of Charles E. & Elizabeth Bossard, Harold and Jesse had two sons, Harold Genung & John B. " Jack " Genung Jesse Bossard married 2nd Mr. Heath. Cemetery, Newark Valley, Tioga Co., NY. per Genung genealogy written 1906 states he was born Aug. 29, 1842, if this is so, then he was born before Louisa "Eliza" Genung the first wife of Chester had died, she died in Sept of 1842 ??? died Aug. 13, 1872, born in the Town of Caroline, NY. - farmer - later sash & blind manufacturer. Died at Clyde, NY., buried in Rose Cemetery. Married Nov. 21, 1865 Amelia Caroline Genung, born Jan. 4, 1835 died ?, daughter of Benjamin Genung & Jane Ann Dorland, she was born in Fishkill, NY. She married first to Walter D. Wilson. No children by either marriage. 7. William S. Mosher, born in Dryden, NY., Nov. 6, 1860 married Emma B. Morgan, born June 25, 1870, born in Detroit, Mich. Children; John A., Flossie, Donald. 7. Marthann Genung, daughter of Philo Genung & Charity Cooper born May 10, 1829 died Dec. 31, 1834 buried in Snyder Hill Cemetery. 5. Christopher Peron Genung, son of Benjamin Genung & Hannah Beach born ? died 1856, born in Morris Co.,NJ. Farmer on Snyder Hill, Town of Dryden, NY. Was 27 years in the west, during which time he was in the Army and fought in the Black Hawk War. Died at Newfield, Tompkins Co., NY where he lived. He is buried in Dutch Reform Cemetery, West Slaterville, NY. Married 1820 Lozetta Haywood born 1798 died July 21, 1826, killed by lighting in Newfield, NY. Buried at Dutch Reform Cemetery, West Slaterville, NY. Children; Calvin H., Elias William. 1. Calvin H. Genung, son of Christopher P. Genung & Lozetta Haywood born Sept. 24, 1821 died Sept. 30, 1890 - born at Snyder Hill, Town of Dryden, NY., Enlisted July 29, 1862 at Newfield, NY - as private in Co. A 109th N. Y. Vols. Wounded at Welden railroad Aug. 24, 1864, losing a eye. Honorably discharged Jan. 25, 1865 for disability. Farmer in Newfield, Tompkins Co., NY. Buried at Trumbulls Corners Cemetery, Newfield, Tompkins Co., NY. Married March 29, 1851 Susan E. Fish, daughter of Philip & Mary Fish, born Sept. 20, 1834 died Feb. 21, 1888. buried at Trumbulls Corners Cemetery, Newfield, Tompkins Co., NY. Children; Charles W., J. Eugene, Ida M.
1. Charles W. Genung, son of Calvin H. Genung & Susan E. Fish, born Dec. 9, 1852 died Dec. 1935, born in Newfield, NY., Farmer - lived at Trumbulls Corners, later at Horseheads,NY. Married Dec. 25, 1876 Eula C. Vars, born Feb.. 22, 1860 Children; Morris Reed; Grace Mary; Leon Herman. 3. Ida M. Genung, daughter of Calvin H. Genung & Susan E. Fish, born April 24, 1858 - born at Newfield, NY - lived in Lathrop, Mich. died 1919 - buried in Detroit. Married Erastus Quick. 2. Elias William Genung, son of Christopher P. Genung & Lozetta Haywood Went by the name of William H. for some reason. born March 24, 1823 died June 30, 1864 Born at Snyder Hill, NY., and died at Bull Run. Farmer on Snyder Hill, Spencer, Tioga Co., NY and other places. He enlisted as private in the Civil War. Wounded and died in hospital. Unknown where he is buried. Married July 7, 1844 Lydia Williams, daughter of James Williams & Elizabeth Snyder, born April 26, 1824 died July 28, 1887 Born at Snyder Hill, NY., Buried in Snyder Hill Cemetery, Town of Dryden, Tompkins Co., NY. Children; Lusetta; William H., Genella M., Victor E., Eugene A., Elinora C.
1. Lusetta Elizabeth Genung, daughter of Elias William Genung & Lydia Williams born May 20, 1845 died Oct. 15, 1927 She lived on Ellis Hollow Road, Town of Dryden, NY. Born in Spencer, Tioga Co., NY. Married Sept. 19, 1878 Don Juan Turk (also spelled Turck), son of Henry C. Turk & Mary A. Babcock, born April 15, 1853 died 1915 - Both are buried in Snyder Hill Cemetery, Town of Dryden, NY Children; Marshall H., Harry C., William H.
1. Marshall H. Turk, son of Lusetta E. Genung & Don Juan Turk born June 13, 1879 - Farmer in Newark Valley, Tioga Co., NY Married Jan. 1, 1905 Carrie B. Chrysler, born Sept. 16, 1882, born at Owego, NY., daughter of Oscar Chrysler & Mary Snapp. Unknown if they had children. 2. Harry C. Turk, son of Lusetta E. Genung & Don Juan Turk born April 21, 1881 - has headstone in Snyder Hill Cemetery with his birth date on it, no death date. Unknown where is is buried. Married Feb. 22, 1916 Nellie M. Tracy. Unknown if they had children. 3. William H. Turk, son of Lusetta E. Genung & Don Juan Turk born March 14, 1887 died Jan. 28, 1943 buried in East Lawn Cemetery, Ithaca, NY. Married Ada Cleveland Married 2nd Miss _______Burns William H. Turk was a lot owner at East Lawn Cemetery, Ithaca, NY., of Barbara Neigh Turk age 54, died Nov. 28, 1877 and Maud Lena Turk, age 9 months, 21 days, died Sept. 29, 1909 - unknown how they were related. Buried in East Lawn Cemetery, Ithaca, NY is Mary E. his wife 1888-1954. 1. Florence Northrup, daughter of Pearl C. Genung & Frederick Northrup born 1892 died March 24, 1980 married Leon D. VanDemark no children - Speedsville Cem. 3. Myrtle Northrup, daughter of Pearl C. Genung & Frederick Northrup born April 1, 1911 died 1971 - buried in Speedsville Cemetery, Town of Caroline, NY married William Jordon. Children; They had 2 sons, 2 daughters. 2. Thelma Pickert born June 22, 1909, died April 24, 2002. Thelma married Richard Tutton, born Sept. 9, 1909 died January 9 1997.
c. Male child, a still born. 3. Charles H. Pickert, born abt. 1898, was killed in the 1940's in a motorcycle accident near Calvary Cemetery, Rt 79, Ithaca, NY. 3. Genella Martinett Genung, daughter of Elias William Genung & Lydia Williams born July 3, 1851 died Feb. 11, 1921 buried in Snyder Hill Cemetery, Town of Dryden, NY Married Jan. 3, 1869 Charles Cornelius, son of John Cornelius & Priscilla Waite, born March 9, 1847 died Dec. 7, 1929 buried in Snyder Hill Cemetery, Town of Dryden, NY. Children; Mahlon Brown Cornelius, Maude Cornelius. 1. Hettie Lydia Genung, daughter of Eugene A. Genung & Eliza Cornelius born May 5, 1879 - was living in Berkshire, Tioga Co., NY when she married Married Dec. 4, 1895 Harry Wilson Lormor - Farmer and Hostler, son of George W. Lomor by adoption. Children; Velma born Nov. 22, 1896; Llewellyn Roosevelt born Oct. 6, 1898, was adopted by Stevens family and changed his name ot Louie L. Stevens; Herbert Eugene born May 17, 1900. 2. Eula Pauline Genung, daughter of Eugene A. Genung & Minnie Hicks born June 6, 1893 died July 6, 1977 in Candor, Tioga Co., NY. Buried in Candor, Tioga Co., NY. Married in Caroline Center, Tompkins Co., NY on March 17, 1915 to Arthur Leroy Richards born Aug. 13, 1894 died Nov. 19, 1993, son of George Richards & Alice Mount 7 children; Robert Eugene; Clifton Arthur; Phyllis Minnie; Bruce Edward; 2 unknown. 3. Guy A. Genung, son of Eugene A. Genung & Minnie Hicks, born Aug. 28, 1895 - in 1922 he was a foreman in Ithaca, Tompkins Co., NY at S. C. Co. and lived at 918 North Aurora Street. 6. Elinora Capitola Genung, daughter of Elias William Genung & Lydia Williams born April 19, 1861 died ? Born in Penn., lived at Pine Valley, NY. Married Henry Turk (Turck) born Dec. 5, 1857 died April 8, 1940, son of Henry Turk & Mary A. Babcock. He was a Farmer. They had a child - Mary Turk, born Nov. 28, 1881 died 1924, Mary lived in Danby, Tompkins Co., New York, Married Frank "Jack" Otlz born 1881 died? Mary is buried in Inlet Valley Cemetery, Ithaca, NY. Elinora divorced Henry Turk. Married Elmer Holmes born ? died ? Children; Judson Holmes born 1888; Lillian Holmes born 1890. Henry Turk re-married to Charlotte L. Ostrander 1867-1842 buried in South Hill Cemetery, Ithaca, NY., they had several children. 6. Timothy Genung, son of Benjamin Genung & Hannah Beach born Sept. 7, 1795 died before 1853 - Born in Morris Co., NJ. Lived on the old homestead in the Town of Dryden, Tompkins Co., NY. Never married - was living with his brother Philo Genung in 1850; He was 54 years old at that time. Buried in Dutch Reformed Church Cemetery, West Slaterville, Tompkins Co., NY.